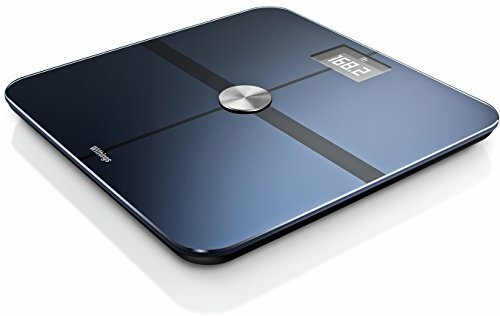 A Wi-Fi scale that uses patented Position Control technology to deliver the most accurate readings of your body composition (weight, body fat, muscle, bone and water). It automatically synchronizes with your smartphone to display your trends and help you reach your weight goals. Full Body Composition analysis: Get high-accuracy weight, BMI, body fat, muscle, bone mass and water measurements thanks to Position ControlTM technology. Nutrition Tracking: Set a weight goal and manage your daily calorie budget accordingly with the nutrition tracking feature (in partnership with MyFitnessPal). Daily Weather: Step on your scale to enjoy a localized weather report and plan your clothing for the day. Multi-User: Up to 8 users can weigh themselves and access their personal weight history. Plus the Withings Body automatically recognizes who's who.